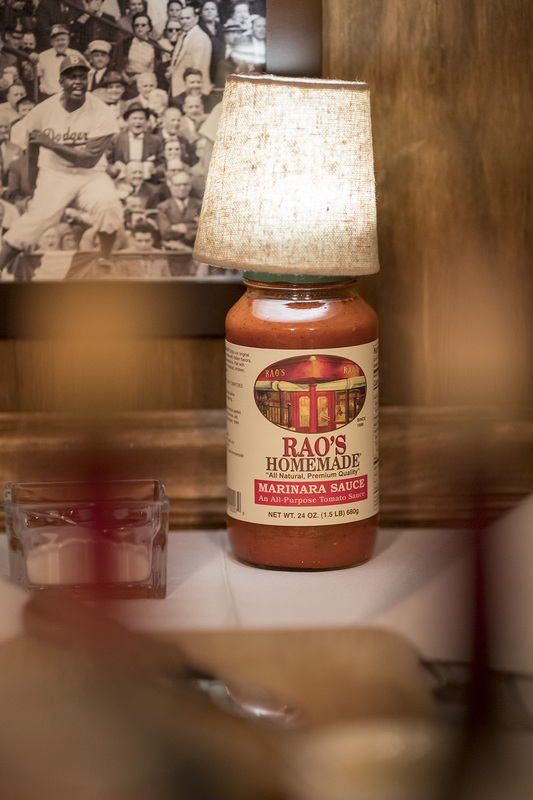 The original Rao’s on 114th St. in East Harlem, New York City, the legendary and exclusive eatery established in 1896, was recreated in Chamblee, GA, for Super Bowl LIII in a hospitality program with Wheels Up. VIPs, special guests and talent were invited for pop-up dinners by Rao’s executive chef Dino Gatto over three nights leading up to the big game. BMW served as a partner on the first night’s dinner, and Momentum Worldwide on the second and third nights’ dinners. The exterior of the building featured Rao’s signature red façade and authentic street signage (complete with a copy of an actual flyer that exists currently on a street post outside the real eatery). Adjacent to it was an LED screen that displayed the street scene surrounding Rao’s in New York complete with lights and sounds that transitioned from day to night. The interior replicated that of Rao’s with the same tables, chairs and fabrics, the same plates and silverware, and photos of famous patrons hanging on dark, stained wood-paneled walls. For BMW’s night, some of the photos were replaced with vintage BMW advertising creative. There was a public event, too. On Saturday, Feb. 2, Wheels Up hosted the Wheels Up Super Saturday Tailgate on an adjacent lot that attracted 2,000 people, and included, of course, meatballs and sauce. The event program is a venture between Wheels Up and Rao’s Restaurant Group that came to fruition in 2018 as a hospitality experience at The Masters in Augusta, GA. Agencies: Beachview Event Rentals & Design, Savannah, GA (production and build); Allied Productions (a/v); Momentum Worldwide (promotion). The post Famous Rao’s Restaurant Pops Up with Wheels Up for Super Bowl Dinner Events appeared first on Event Marketer.